At Aus-Sino Trade Alliance, we are committed to providing our customers with a comprehensive range of quality Australian beef products to meet the needs of their customers in Australian beet meat products across a range of market segments, From the best grade quality Australian Angus beef to restaurant ready fresh offal, we deliver the quality products and cuts. Our expertise is in aligning the customers product needs and reflecting this through the sourcing, preparation, management, transportation and all related documentation for customs clearance and regulatory compliance for animals welfare that will deliver the required quality Australian beef products. As we grow, we plan to expand our product offerings to enable us to be a one stop supplier to targeted market segments such as High End western hotel chains, local restaurant chains, and consumer focused online distribution in quality Australian beef meat products. 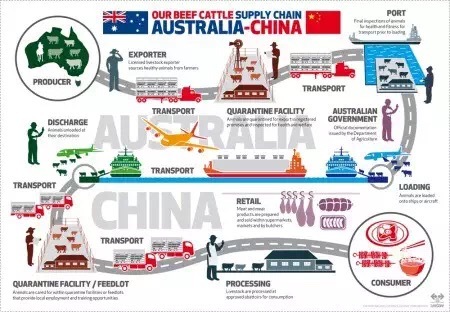 With our Australian supply chain expertise, we can also assist other Chinese partners looking to import breeder and feeder quality live cattle from Australia. Our animal welfare focus processing facility will also be able to assist our product customers to understand how to define their needs and select cuts and processing specifications to deliver the correct taste and eating experience they are expecting. Our live cattle procurement service follows a strict and audited procedure, ensuring livestock sourced meet the highest standards of export animal welfare. Our live cattle sourcing in Australia is based on the product needs of our clients, ensuring a reliable and reproducible product across shipments in supply chain. Our Australian live cattle export services work closely with all links in the supply chain to understand live cattle supply chain requirements and availability. We are strongly committed to the animal health and welfare of our livestock, ensuring our export practice complies with the stringent supply chain requirements of the Australian Standards for the Export of Livestock (ASEL) and the Exporter Supply Chain Assurance Scheme (ESCAS) of Australian livestock trade.